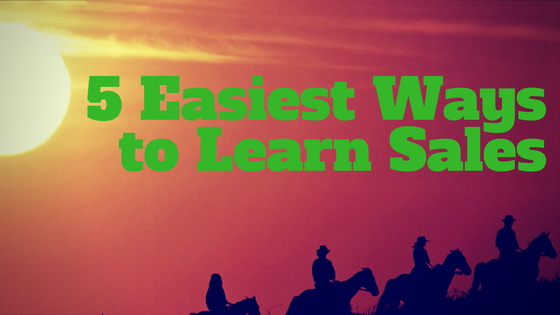 This blog post will cover the 5 easiest ways to learn sales. A lot of people get caught up trying to figure out how to learn sales, who they should turn to, and what to do. Every business person knows that sales will increase profits, so learning the skill is vital to any business. You’re complicating it, though. Here are the 5 easiest ways you can learn the skill of sales. Whether it’s a manager or a coach, you need a mentor who will come alongside you, influence you, and show you how it’s done. It needs to be someone that you can work well with, someone who inspired confidence and that you can trust to ensure they’ll steer you in the right direction. You need to work with a proven sales system that you’re comfortable with. The fact is, that if you aren’t comfortable with it, you won’t bother using it. It’s difficult to implement a process that you don’t feel at ease using. If you persist in using a system or process that you’re not comfortable with, the customer knows. So, it is vitally important that you find and learn the process or system that you feel relaxed using in your sales. Think of any professional athlete… chances are, they got to where they are today because they spent a lot of time practicing. Like anything, the more you do something the better you will become at it. It doesn’t matter whether you have to practice your craft in the mirror, or on family and friends, or you can pick up overtime at work. The more you work on those sales systems, the better you will be at learning, thus making sales. When you start working in the process, there’s a need to tweak. Your personality plays a big part in making sales because people do buy people. Provided you are practicing regularly, you’ll start to pick up on bad habits or other areas in which you can improve. This is why practicing your craft on family and friends is an excellent way to hone your skills. They may pick up on behaviors that you didn’t, or notice certain issues that you won’t notice. Don’t feel like you can’t imprint your own techniques and personalities on your sales system once you’re comfortable with it. After all, no one wants to buy from someone who comes off as a robot. Don’t be afraid to put your personality on the show. If you implement all of these components you will see that you’re making more clients, thus bringing more money into the company. It’s important to take time out to analyze what it that has been working for you. Whether you do that by keeping a notepad on your person to make notes about what went right in a sale, or whether you note down some negatives that you can later correct. Analyzing what works (and what doesn’t work) is an important aspect of ensuring that your sales system is working for you. Remember to learning sales is a skill and when learning the right way take time. If you use these traits you will have 5 easy way to learn sales for your business. Remember if you like or love your product. Learn to sell it. Mr. Brown is the author of best-selling book “Master the Art of Closing the Sale” (go here to get your copy). He has worked with hundred of clients to help them double their sales with successful sales strategies, Go here to get free 10 step sales guide, “10 Step Sales Guide.” Feel free to send Benjamin a message here.